To find a way to present Lumenis’ new treatment approach, Acoustics & Heat, in a way that shows not only the new products and their capabilities but also to position Lumenis as a leader in their field. 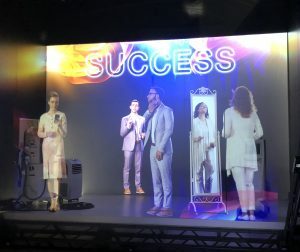 We created a holographic show that incorporated two layers of projection, together with real products and a live actor who led the show. Through testimonials of real doctors already using these products, filmed actors acting as satisfied patients, and a dynamic dialogue with the live actor, we delivered Lumenis’ messages in an interesting and effective manner. 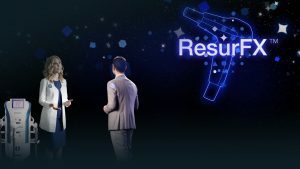 This unique combination of the hologram and the live actor created the feeling that the doctors and patients were right in front of the audience. Through that we created a more personal and eye level experience. 100’s of visitors experienced the VIP room and holographic show over the course of the exhibition. Visitors expressed how impressed they were by the presentation- they were captivated for the entire duration of the show. Making it much easier for Lumenis’ sales staff after each presentation, as the audience already knew about the products and the benefits for them.